Another year, another anniversary! Thank you Readers, for loving ickle & Lardee's adventures and still having such an overwhelming enthusiasm for everything they do. I have a couple fun announcements and updates just to catch you up with what's been going on. 1) First up, if you haven't had a chance yet, please visit My Milk Toof on Instagram for a special behind the scenes look at the project. I've been having fun staying connected with everyone during shoots, and sharing a little glimpse into all the work that goes into making a story. Hope you like it! This time around I have decided to independently publish the book, which has been a great experience. Although there is much more work to manage on my end, I have enjoyed the process and creative control that accompanies self-publishing- And hopefully that will equal a really great book you will all love even more. The new book will only be available for sale on the My Milk Toof shop site. More info to come! *For International Readers: Although the book will be able to be purchased online internationally from the shop site, I do realize the cost of shipping/customs can be quite expensive. To help make the book more accessible, I'd like to ask you for some help! 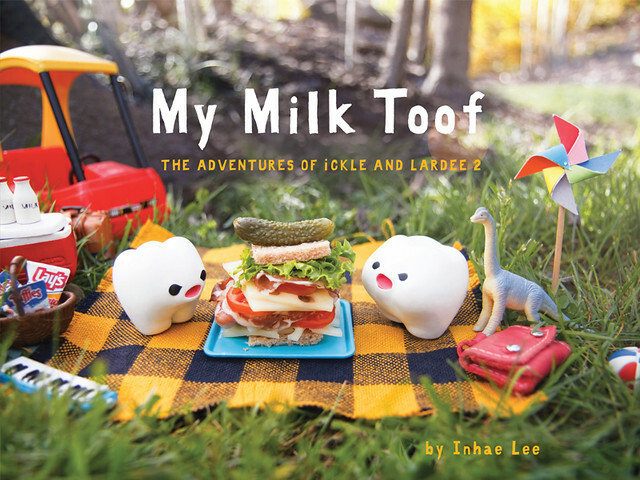 If you know of any local stores or boutiques outside of the United States where you previously found the first My Milk Toof book or think would be a great fit to carry the new book, please leave me a comment/email with that store's name and whatever information you can provide. I will do my best to reach out to those retailers and see if they will carry the book. That way, we can cut down on an otherwise hefty shipping cost for you. Thank you! 3) Many of you have been inquiring about an update on the vinyl toy, but unfortunately I don't have much yet to announce except that I am still working on it. I want to be optimistic that it will be ready for possibly Christmas 2013, but I've discovered the amount of work that goes into making things like the toy are unpredictable. Please rest assure though, I am intent on making this happen. 4) Lastly, I am proud to announce my first art show, THE ART OF MY MILK TOOF, here in San Francisco, California. The show will take place from April 6 - May 1 at the Rare Device Gallery, and will feature high-quality framed prints from some of my favorite ickle and Lardee Adventures (including some from the new book)! I will be at the opening reception on Saturday with a handful of advanced copies of the new Book 2 for purchase- one month before they release on the shop site. So save the date, and I will have more information to come in the weeks ahead. "I only want to live in peace, plant potatoes, and dream!" Love it :) I can't wait to purchase the book! It's a great gift for my friends who have kids!! Awesome news!! My wife and I can't wait to see book #2 for our little one in the oven and also to attend your art show in SF!! Soungs awesome (and also like a load of work for you...)! I can't wait to see the next book! My little brother and me are the best spanish fans of your blog. I'm following My Milik Toof on facebook, twitter, instagram... and we sometimes visit the blog every day. My brother laughs a lot with Ickel and Lardee adventures. We bought de first book in amazon, because shipping to Spain isn't expensive. My question is: the book will be available in this site also in May? Sorry for the bad english, i'm twelve years old. YES, a second book. I love the first one and can't wait for the second time of giggling over a book ;) In Berlin, Germany you should contact the "Kulturkaufhaus Dussmann". I have bought the first one there and they always had a nice little stock of them afterwards (they have a really nice department for English books in general). I think the right email adress should be kuka-service@dussmann.de (it's the logistics and organisational department). My favourite local bookshop is Big Green Bookshop - they might be interested (and suspect there would be a good take up in London. I can imagine them stocking your boys and them going down really well there. Great news! Can't wait for the book! Well done on *everything*! My Milk Toof is truly such an achievement - I love it! Wow I can't believe it's been that long...amazing! and congrats! I hope I'll be able to buy that 2nd book in Singapore! You can try Kinokuniya, they sell books from many web comic writers. ickle and Lardee, stay awesome and cute! wanna purchase the book please! So excited for the new book! And for your art show in SF - I have plans on opening day but I'm really hoping to make it to meet you and get a book! I've been a longtime fan of yours :) And I'm going to dental school this fall so I'm even more fond of these little milk teeth than I already am! Your fantastic four poster totally cracked me up! I am so looking forward to more of their adventures. Have been a big fan since someone told me about your website ;) Inhae, keep up the GREAT work! I do love your creatures and of course willing to buy the next book if only possible t ship it to European Union. Unfortunately do not know any possible institution to "stock buy" it as we are so few here in Finland, but I will put a query round. Waiting for May and spring and the new adventures of Ickle & Lardee. Hi Inhae! Great to know that your 2nd book is coming. I bought the 1st book from Kinokuniya Kuala Lumpur. Hope to see 2nd book soon!! I'm excited! The first book was a gift from my best friend who actually bought it online. I would really love it if I could purchase it at a book store. As someone above me has mentioned in Australia: Kinokuniya and Dymocks. I also get a lot of my books from the book depository, I wonder if I could get them from there this time? Good luck! I can't wait to see the next book! Joyeux Anniversaire les petites dents! Here in Paris, Jo, a 5y old boy, is waiting desperately for the second book (and also SWVII). I'm from Austria (Europe) but I can't wait to purchase the book! Congratulations on your 4th anniversary, all the best with your future plans! Wheee! A new book about my favorite teef! :-) keep up the great work, Inhae! My beSt wishes for your art show! I' m in love with our little friends. Wonderful stories and wonderful contest! Oh my goodness! I will certainly come to your art show in SF. I really hope I can make it on opening day. Thumbs up for independent publishing, I know that's a huge amount of work. Good luck with everything!! I haven't seen the book anywhere in Poland, but I think if you could contact Massolit Books http://www.massolit.com/, that would be just great. They seem like just the kind of people. Toronto, Canada definitely wants the book! Love your stories so much! I believe the 1st copy of your book can be found at Kinokuniya bookstores :) can't wait for your second book to appear there! So, so, so, so, SO good to see the adventures of ickle and Lardee pick up steam again, Inhae! I'm not sure how I managed so long without them in my life - they and their antics are simply priceless! Yay!! Is the opening event 3/30 or 4/6, and could you share some more info about it? I can't find the specifics on the Rare Devices site. Thanks! ¡Qué original y simpático tu blog! 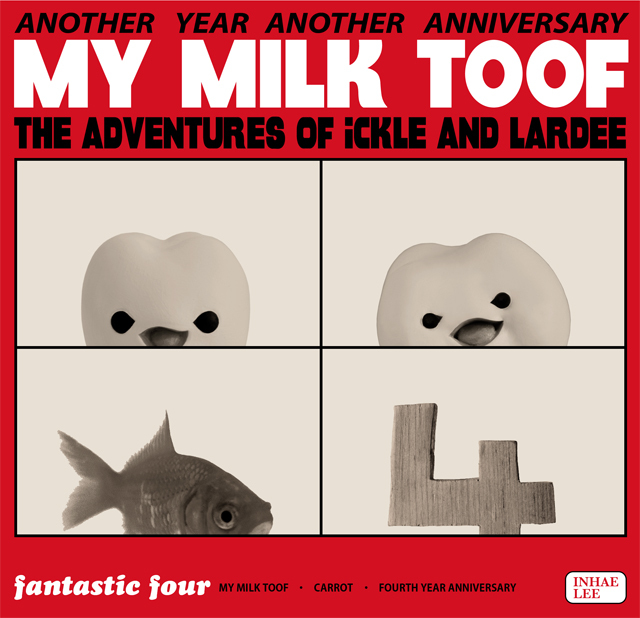 Can I buy My Milk Toof: The Adventures of ickle and Lardee 2 from Amazon. Last time I buy from Amazon, the price + shipping fee is quite good. and I'd love to have MMT here. Hi. I am Pui Jing. I have purchased the first book of ickle and lardee on amazon UK when i was in the UK. I am now back in Malaysia. oh a new book, I can´t wait to see it. I´m living in Germany so please let med know where I can purchase the book. & thank you again for the laughter & joy those two rascals bring to us! lots of people love you work !.